Close to 5,000 people died in motorcycle crashes in the United States in 2015. That’s just one of the glaring statistics by the Insurance Information Institute that highlight the dangers of riding a motorcycle. 88,000 people were injured. More than half the people who were killed were more than 40 years of age, in part due to declining reaction times and decreased eyesight. Alcohol use and speeding were the two leading causes of motorcycle fatalities. At Harris Lowry Manton LLP, our Atlanta motorcycle accident lawyers understand how devastating these crashes can be. Our team of lawyers works with families when a rider is killed and with the victim when he/she has been injured. We have obtained some of the top verdicts and settlements in the state in wrongful death and catastrophic injury claims because we work with your doctors and our medical network to detail each moment of physical and emotional pain. When a motorcycle accident happens, the rider and any passengers almost always fall directly to the ground. Some are thrown into other vehicles. Unlike cars and trucks, motorcycles do not have the front, hood, rear, or sides of the vehicle to protect the rider. In many cases, the rider cannot even brace himself for the fall because larger vehicles usually fail to see them. A TBI can lead to death. Survivors often require extensive physical, occupational, and psychological therapy. Many survivors have to live with a decreased ability to function and enjoy life. Spinal cord damage. Riders who fall off their motorcycle can damage their spinal cord, which supports the neck and back. Complications can include paralysis, loss of bladder and bowel control, breathing and circulatory problems, muscle damage, and depression. A spinal cord injury usually means a lifetime of chronic pain. Broken bones. 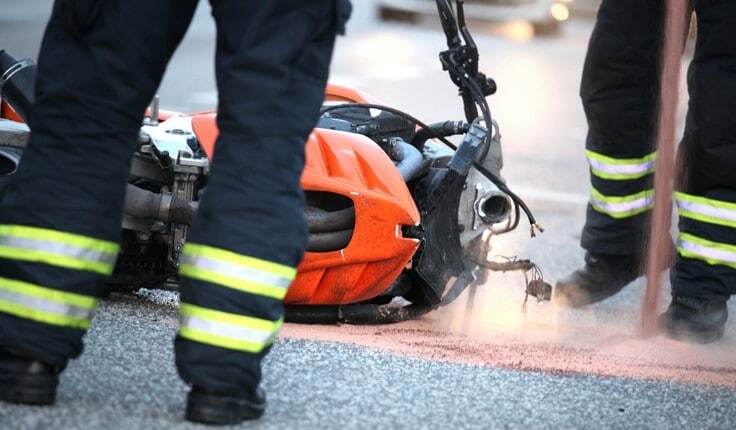 Fractured limbs and broken ribs are a normal consequence of a motorcycle crash. Even when bones heal, which can take months or even years, the victim can live with a lifetime of residual pain. Surgeries, multiple doctor visits, and extensive therapy sessions are commonplace when a motorcycle rider falls to the ground. Our Atlanta motorcycle injury attorneys document each treatment and get medical reports from your doctors so the jury and insurance companies can understand exactly why you hurt so much. Delay in acting affects your case — legally and medically. The sooner you see the right doctors, the better your recovery is likely to be. In death cases, we respect the mourning process and guide clients through any grief counseling they may need. To get your case started so you can hold wrongdoers accountable, reach out to the Atlanta motorcycle accident lawyers at HLM to get the guidance and advocacy you need. You can contact us in Atlanta at 404-998-8847 or in Savannah at 912-417-3774. You can also schedule your free consultation by completing our contact form.